Public opening days are Wednesday, Thursday, Friday and Saturday. During the summer season (April to August) the program in the digital planetarium starts at 19:00, the evening performance at 20:30, and evening observation then at 21:30. Additional performances are held on Saturdays - Public Observation of the Sun at 15:00 and Program for Children at 16:00. From September till March the beginnings of the performances are one hour earlier - at 14:00, 15:00, 18:00, 19:30, and 20:30. Admission 30,- to 90,- CZK according to the type of program and the age of the visitor. Program may be changed. Details are available on the Czech page. Here you can find links to the home pages or e-mails. E-mail of our observatory is astrohk@astrohk.cz. 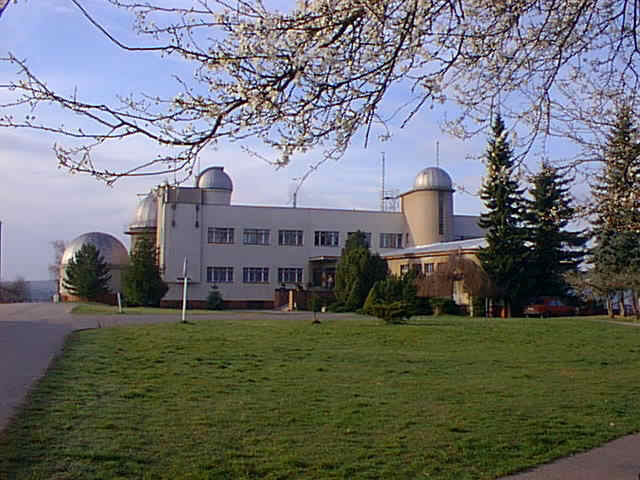 The Observatory and planetarium are located on the southern outskirts of Hradec Kralove - regional capital of eastern Bohemia. One of the most beautiful places was selected for the building - on the ridge between Zamecek and New Hradec Kralove. A breathtaking view opens onto the lowlands of river Labe and to the south on a smooth valley with mirrors of Datlik and Roudnicka lakes. 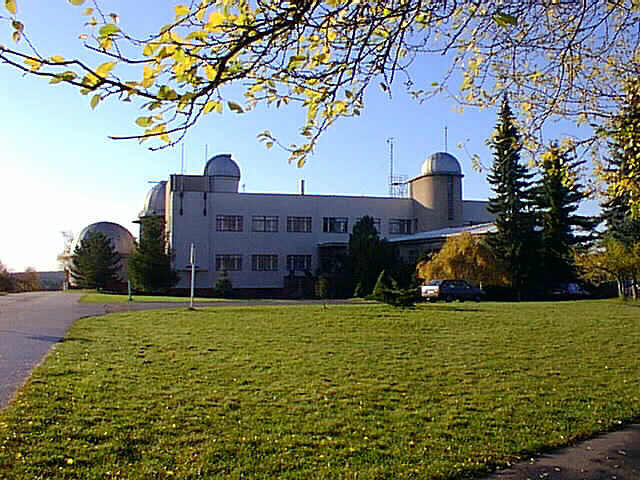 The bulid-up of the observatory was held from 1947 till 1961. 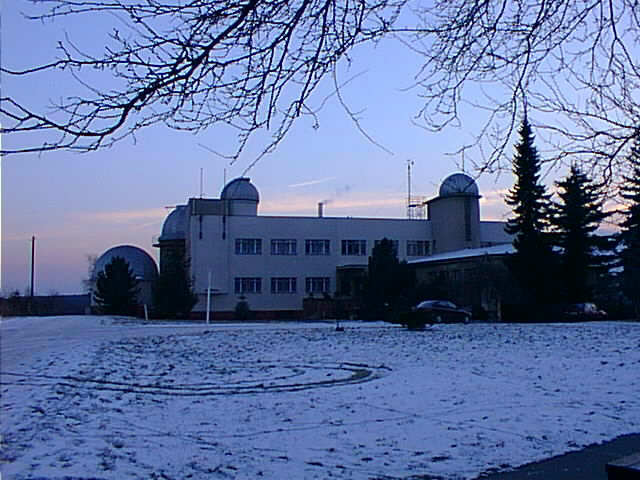 One branch of the Czech Hydrometeorological Institute - Solar and Ozonospheric Observatory and a part of the Institute of Atmospheric Physics, Academy of Sciences of the Czech Republic, are also housed here. The geographical coordinates of the main dome are 15°50'21" east longitude, 50°10'38" north latitude, 287 m above the sea level. Refractor 200 mm in the main dome. 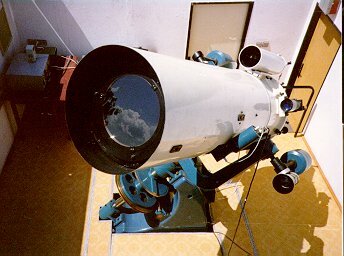 The telescope is placed on a Zeiss equatoreal mounting. The diameter of its lens is 200 mm, the focal length 3500 mm. Reflector Newton 250 mm, ratio 1:5, i.e., the focal length 1250 mm. The telescope was added on the equatoreal mount to the main refractor. The manufacturer is Jiri Drbohlav from Rtyne v Podkrkonosi. Reflector Schmidt-Cassegrain 280 mm, with the focal length 2800 mm, ratio 1:10, on an alt-azimuth automated mount. It is mostly used for visual observation from the roof of the observatory. The manufacturer and type is Celestron CPC 1100 GPS XLT. Jan Sindel Telescope, Newton 400 mm, ratio 1:5, focal length 2000 mm. Large telescope on an automated mount is located in the observing house. The manufacturer is again Mr. Drbohlav. 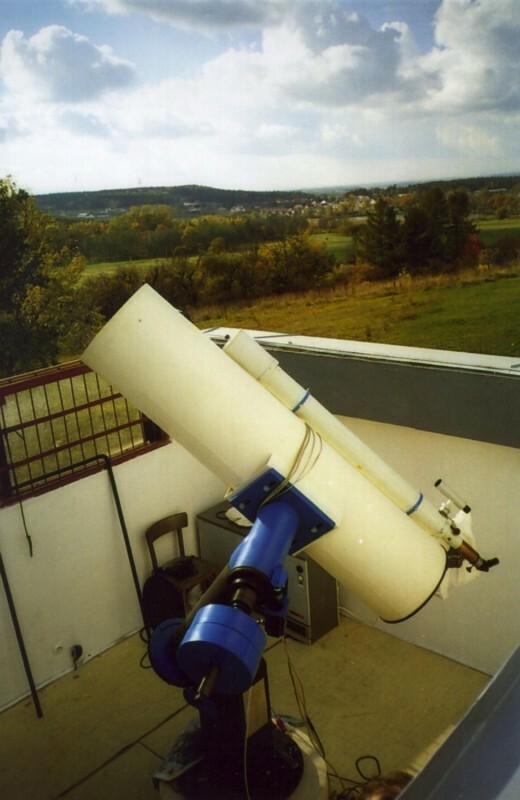 This instrument, a joint project with the Astronomical society in Hradec Kralove, is used for astrometry of comets and photometry of variable stars and asteroids. More details are avaiable at the scientific program pages. Schmidt photographic telescope with parameters 420/600/1000 is in the observing house. It was used for the determination of positions of comets, asteroids and satellites orbiting the Earth. Small refractor with objective diameter 110 mm situated in the observing house. Two Cassegrain telescopes with mirror diameter 150 mm and focal length 2250 mm. One of them is equipped by a meniscus. Big and small binoculars 25×100, 10×80, 12×60. Small Zeiss projection planetarium. Projection dome of the planetarium is 6.5 m in diameter. Digital planetarium in the new building, with five special Velvet projectors developed by Carl Zeiss Jena company. Approximately 12 milion pixels are projected on the Spitz Nanoseam dome with a diameter of 12 m (i.e. a resolution denoted as 4K). 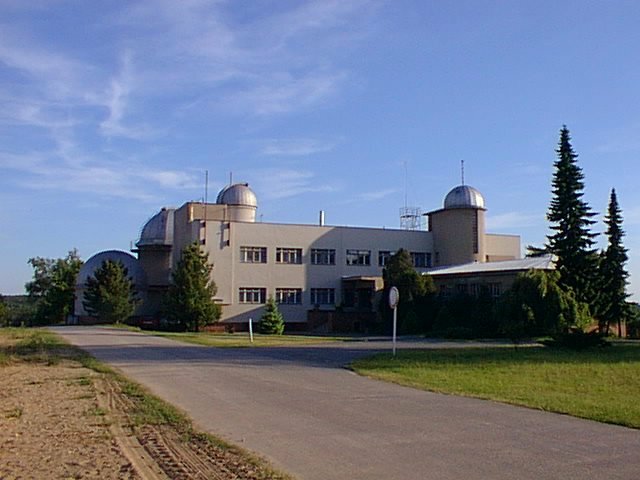 © Observatory and planetarium in Hradec Králové, M. Brož aj., http://www.astrohk.cz/, webmaster@astrohk.cz; version Dec 7th 2014, printed at Apr 20th 2019 20:11:53. The text is issued with Creative Commons Attribution-ShareAlike license. These pages are archived by National Library of the Czech Republic.